QUALITY CONSTRUCTION. Offering a perfect blend of comfort and support, these Boxing Handwraps are expertly crafted using durable, elastic conforming material to hold up to everyday wear and tear. The material is also machine washable for easy cleaning and care. VERSATILE USE. Securely fasten the wraps when engaging in boxing, kickboxing, Muay Thai, aerobic boxing, martial arts and other combat sports to protect yourself from unnecessary injuries. CHOICE OF COLORS. To complement everyone's taste, these Handwraps are available in black, blue, purple, white, pink, army green, red, green, yellow, orange, fluorescent yellow, fluorescent green and fluorescent orange. Each color is sold in pairs so you can protect and wrap both hands. SECURE FIT. Each Pro Impact Boxing Handwrap is outfitted with an oversized hook-and-loop closure and strong thumb loop to keep the wrap snug and secure throughout your entire workout. GREAT SUPPORT. 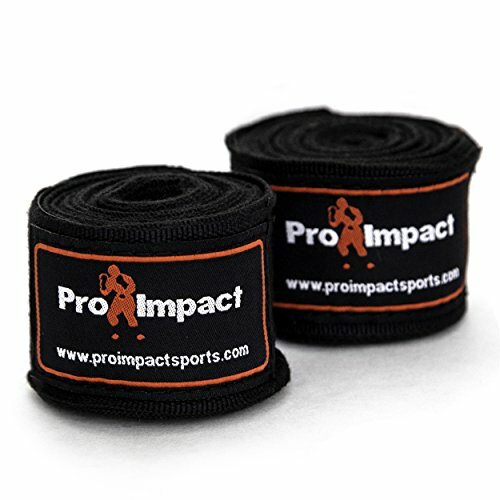 Pro Impact's Mexican Style Handwraps measure 180 inches in length, allowing you to completely wrap your wrists, hands and knuckles for optimal support and protection without adding too much bulk underneath your gloves. Contact sports are fast-paced and action-packed, As such, it’s essential that anyone engaged in these sports wear protective gear to avoid injuries. Offering high-quality and appeal, these Pro Impact Boxing Handwraps offer the protection you need at an affordable price. Wrap your hands with a full 180 inches of elastic conforming material to receive the perfect blend of comfort and support without adding excessive bulk under your gloves. Designed to furnish maximum hand support, knuckle protection and wrist support, this super tough, slightly elastic material is made to hold up to vigorous use month after month. Plus, it's machine washable for easy cleaning when needed. Featuring a hook-and-loop strap closure, along with a special thumb loop with "This Side Down" markings for correct wrapping, these handwraps offer a secure yet comfortable fit throughout your entire workout. Wrap to your desired tightness when engaging in any combat sports to protect your hands, wrists and knuckles from unnecessary injuries. Choose among 13 vibrant color choices to complement your taste or make a bold statement. Available in black, blue, purple, white, pink, army green, red, green, yellow, orange, fluorescent yellow, fluorescent green and fluorescent orange, each pair of Pro Impact Boxing Handwraps is perfect for all your boxing, kickboxing, Muay Thai, aerobic boxing, and martial arts needs.